Who knew such a beautiful, thicc lady could inspire such controversy? 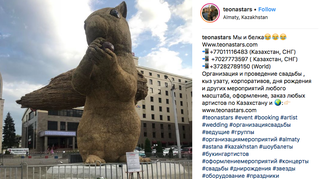 A 40-foot squirrel art installation was erected in Almaty, Kazakhstan, during the city’s recent Art Energy festival, costing residents 23 million Kazakh tenge (about $67,000) in public funds, BBC reports. My girl is made of straw and wood on a steel frame, which has some folks crying “fire hazard!” Some metropolis dwellers think she was a big ol’ waste of money, others think she’s real cute and brings joy to children. Rinsler told the publication the squirrel was meant to symbolize life in Almaty (but, like, he doesn’t live there? ): “Squirrels are our urban neighbors. Like us, they adapted to life in the city, and, like us, they need the resources to survive and thrive.” Okay, guy. The local city hall reportedly contributed 15 million tenge to the installation, which has led some to question the priorities of local government. “She looks more like a rat,” said social media user Tagir, adding that the funds “could have helped those who need money for operations”. Another user said the installation was a “disgrace” and a waste of “our taxes”. My girl will stay in Almaty for at least nine months (if she makes it that long). Then, who knows!